It’s official. We’ve experienced the hottest January since records were first kept. Meanwhile, up in northern Queensland over 4 feet of rain has fallen in the last few days. That’s the average annual rainfall in less than a week. More that 20,000 houses are forecast to be inundated. Forest fires continue to rage in Tasmania. It’s been an interesting start to the year! I’ve been making slow but steady progress with the workshop. The lighting wiring is now complete and I’ve installed the timber framing for the back wall. This has used the last of the scrap timber which means we’re back to involving the plastic card. Hopefully I’ll start installing the insulation and plywood lining on Monday. 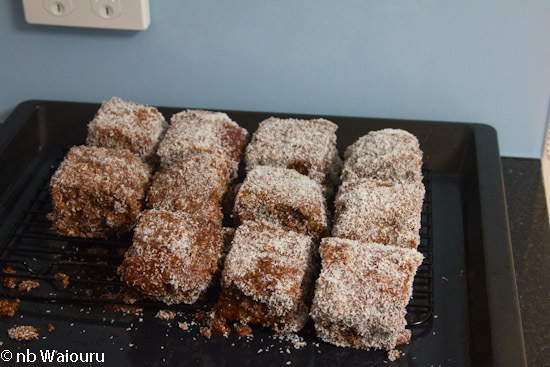 Someone has eaten the last of the ‘ginger gems’ (OK… I put my hand up) so today Jan made Lamingtons. not those little stale bricks you buy in the supermarket. These are man size. Light and soft on the inside and sticky on the outside. I’m being rationed to one daily. BUT WAIT. I’ve deleted the draft post and pasted the text into a new draft before adding the photo using Method 3. (Didn’t work). It appears the OLW situation has reached the point where drafts in OLW won’t publish with or without photos. What are you doing Google? I noticed there was a new post from nb Wandering Bark and was anticipating another video report on the history of the BCN. However it appears Captain Ahab and the first mate have travelled a long way in search of other waterways. Gosh hasn’t Singapore changed since we lived there in the early 80’s. Even back then the Singaporean authorities were becoming concerned about the rapid loss of old architecture. I recall in one part of the downtown area they retained the facades of the old ‘Malaca” style three story houses building new high rises behind. Singapore keeps increasing in physical size as they continue to reclaim more land from the surrounding sea. Most of Changi Airport is on reclaimed land. I don’t believe Andy & Helen are going to find many canals in NZ! But then they may be searching for Hobbits.